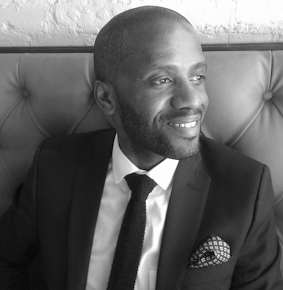 Currently residing in the US, amanze is of Nigerian birth and British upbringing. Not easily categorized, in her formative years amanze sought to determine her own definition of personal identity. amanze's fantastical drawings include an ever-growing cast of characters including Audre the Leopard, Pidgen, and ada the Alien - often described as the artist's alter ego. 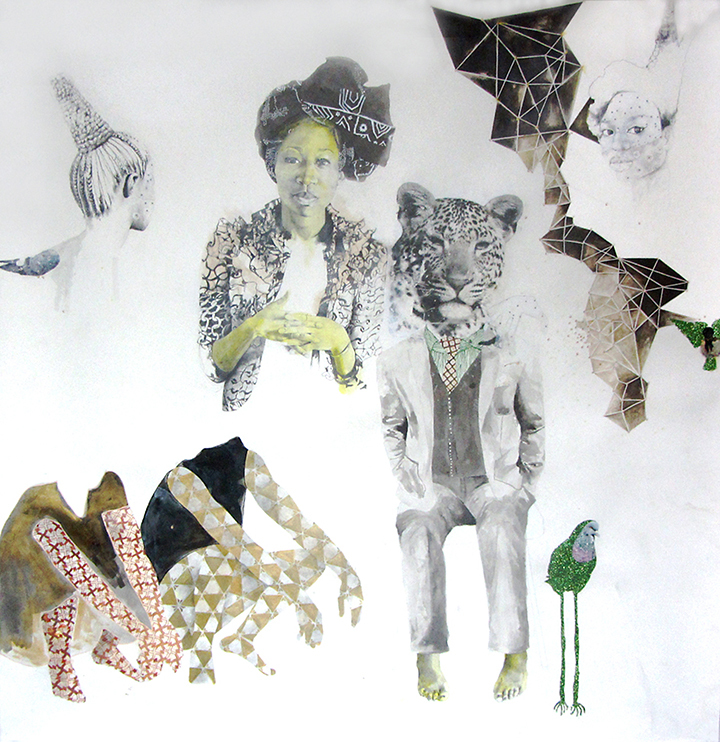 These characters and others were envisioned during amanze's travel to Nigeria as a Fulbright fellow in 2012.
amanze's drawing, kindred (2014) presents her characters in a family portrait that is both stately and playful. Other works such as ada rests in places unknown (2014) and tenderhearted (audre) crosses the sea (2014) place amanze's cast in various otherworldly interactions that volley between the familiar and pure fantasy. amanze has stated that "ada the Alien was born out of necessity: the need to identify a neutral voice through which to tell stories that highlight the complexities of experiencing home as an alien or foreign being." Born in Luxor, Egypt, as a non-Muslim female, Sherin Guirguis' identity was developed in a rapidly changing cultural environment that included her family moving to the US when she was 14 years old. Guirguis originally studied geology, but would later commit herself to being an artist. 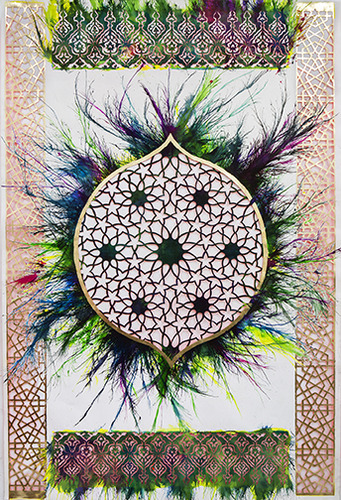 Her visual vocabulary includes a brilliant articulation of abstraction, pattern and geometry. Meleko Mokgosi is concerned with the history of painting. However, through his work he critiques and subverts it. 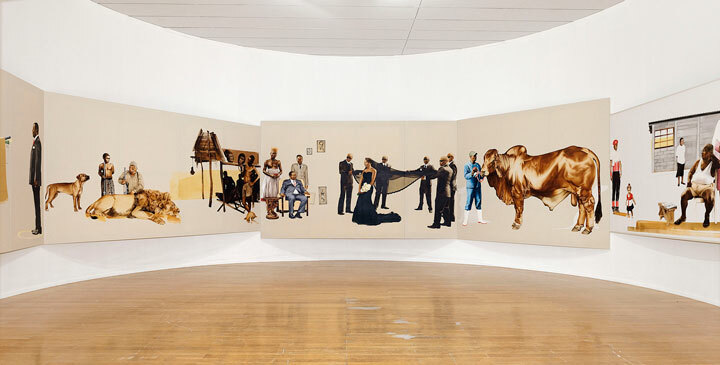 Mokgosi's Ruse of Disavowal (2013) is part of Pax Kaffraria (2010 – 2014) the artist's eight-chapter project that takes Botswana, South Africa, Zambia, and Zimbabwe as case studies. Duhirwe Rushemeza's current body of work evolved from earlier practice developed in response to the 1994 Rwandan genocide where 800,000 men, women, and children perished. Using reductive Linocuts - a printmaking technique - Rushemeza created images of young survivors. 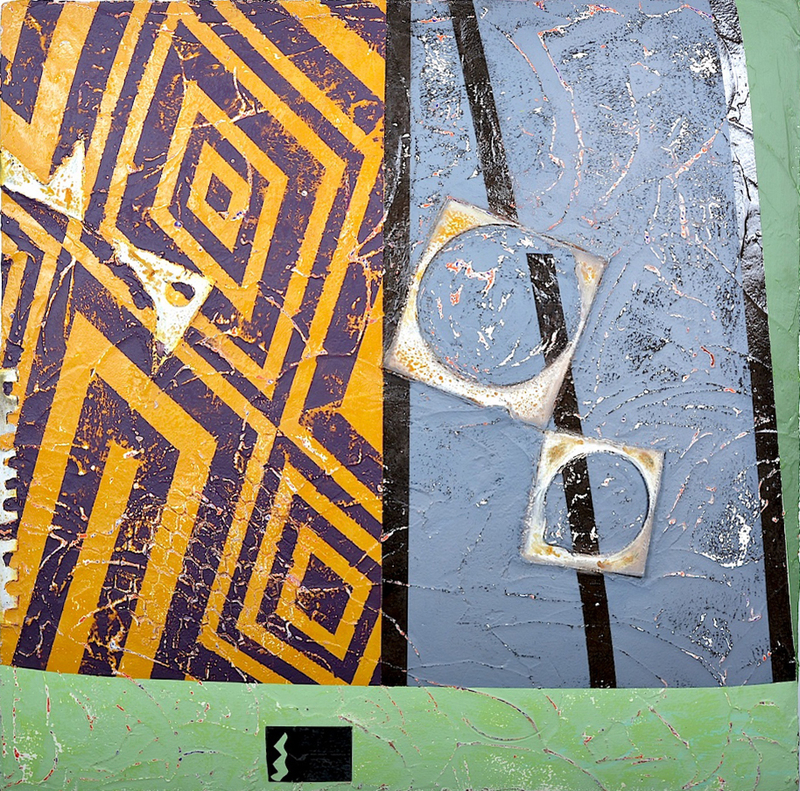 The artist subsequently found inspiration from other aspects of Rwandan history, as well as her travels to Cote d'Ivoire in West Africa, and Germany. Inspired by traditional imigongo cow dung paintings, Modernism, and childhood memories of deteriorated colonial buildings in Rwanda and other African countries, Rushemeza's sculptural paintings Who Am I When I Am Free (2014) and Red Ochre, White and Blue (2014) appear to have been extracted directly from the walls aging buildings. However, they are masterfully constructed in the artist's studio through a process that includes building up dozens of layers of paint and metal detritus, and then stripping away those layers to mimic the effects of weather, erosion, and the passage of time. 2 Yasmine El Rashidi. Artful Passages. 4 Medeine Tribinevicius. Mail & Guardian. An Interrogation of Post-colonial History. June 27, 2014. CAM’s educational and community programs are funded in part by the Goodnight Educational Foundation, The Grable Foundation, the William R. Kenan, Jr. Charitable Trust, IBM Community Grants, SunTrust and the United Arts Council of Raleigh and Wake County. Free Family Sundaes are funded by the PNC Foundation.